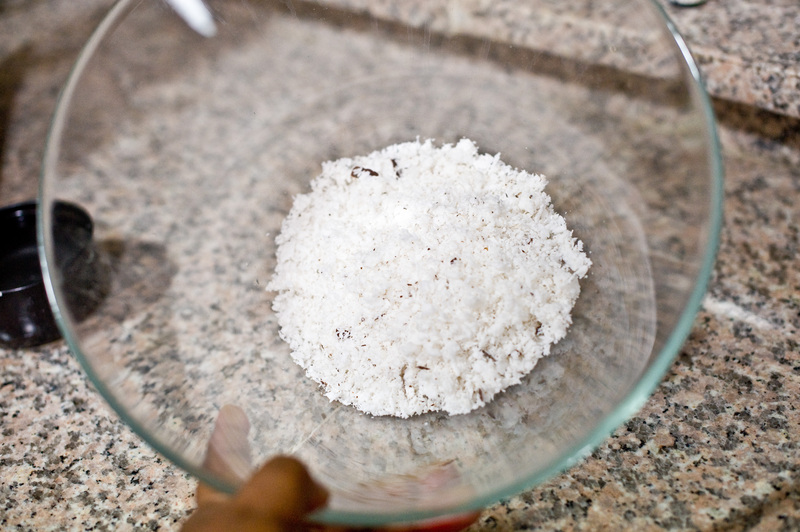 Start with the grated coconut (you can buy the freshly grated coconuts in certain stores or the markets, especially in the Middle East and South East Asia). You should able to get in specialty stores elsewhere. Please let us know where you find yours. We get ours at Lulu or Karama Market. 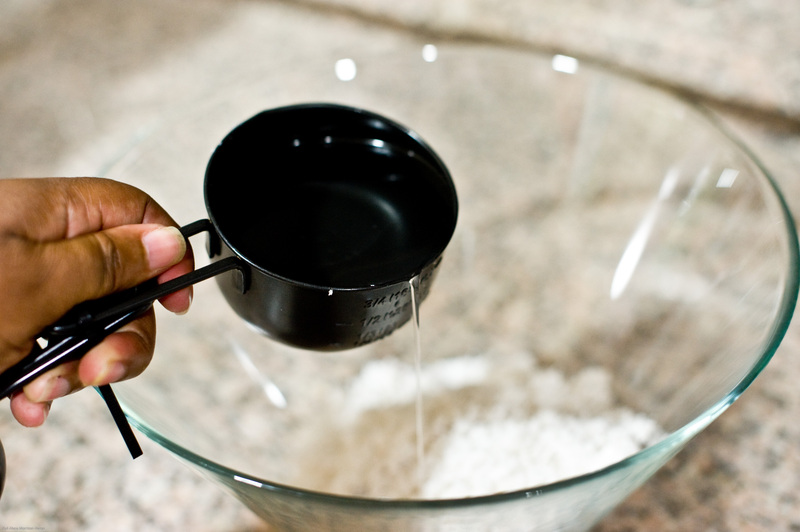 Method: Pour the boiling water on the coconut, use a potato masher to smash it around and to make certain that you smash the coconut down evenly in the water. 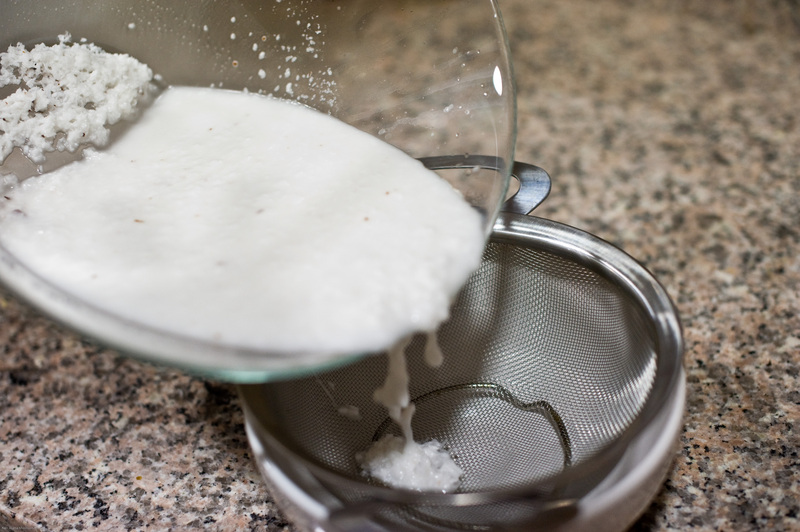 If you have a hand blender, blender or food processor, give it a quick go with the machine to get even more of the milk out of the coconuts through greater agitation. Allow to cool. With clean hands, squeeze and squirt around in the mixture with the excitement of a kindergartener. This will help to milk out the cream out of the coconut. Do for about 3-5 mins or until you graduate from kindergarten wet play. 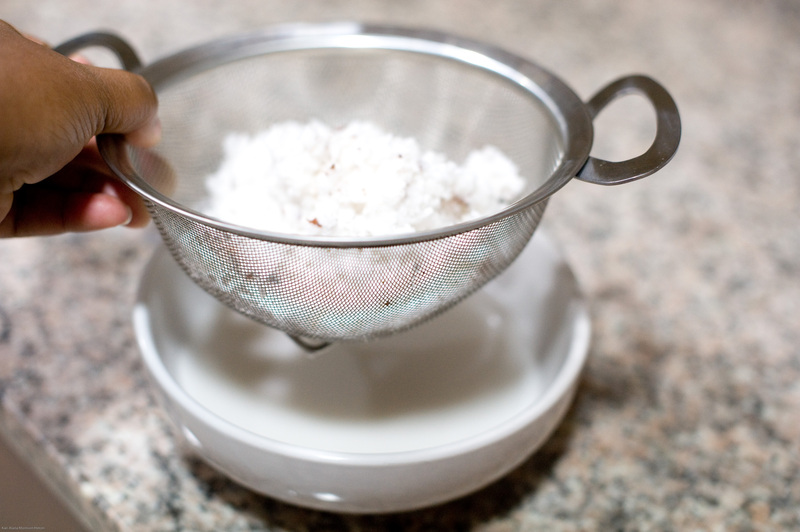 Pour in a container through a strainer and let it drain. You really should use a higher bowl than I did but either way, go back in and hand squeeze a fist full at a time through the strainer until all the liquid is extracted. So now you are left with the coconuts looking like they did when you started… and also, a rich, thick coconut milk that no canned or powdered stuff can ever come close to! Now add this to your next Chef and Steward meal, a vegan Jamaican Ital Red Peas Stew! STEWARD’S NOTE: You could consider doing two batches at a time and freezing half for those times when you don’t have it fresh or are in a hurry and cannot be bothered. 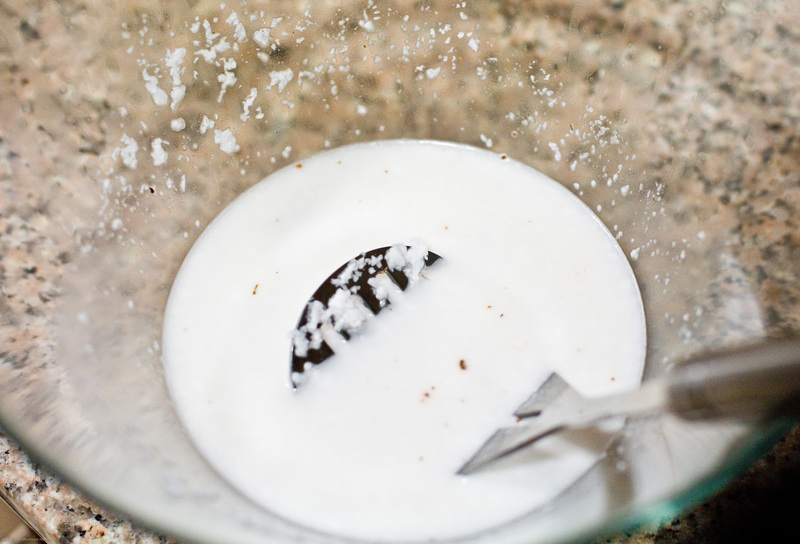 You can just defrost the frozen milk in the fridge or melt on the stove and add to your dishes. It will separate if refrigerated or frozen so don’t worry about it. It will come back together once thawed or heated. For me it is really useful. Whenever I try to get this milk I have to go to an specific market where I know they sale it. I buy it in a tin but once I opened and I found myself that instead of milk it looked more as a cream, so I had my doubts if this could be so healthy or fat free. From now I will do it like this. I must say BETTER DO THAN BUY. 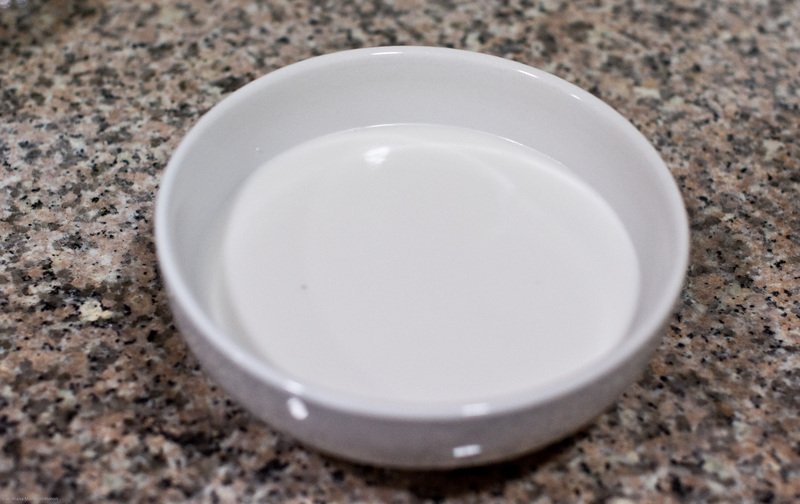 Coconut milk does have fats (like all nuts) but coconut oil is a very healthy fat. Have fun making your own! I have been making my own nut milks for a while and have wanted to try coconut milk. Thanks for the tutorial!